Alla helgons dag in Sweden is a solemn day of remembrance when lighted candles are placed in cemeteries to remember friends and loved ones who have passed away. In my search for information about the day I found many online sources that referred to it as Sweden’s Halloween. From my perspective it is anything but. 731AD the Roman Catholic church dedicated November 1st as All Saints’ Day (Allahelgonadagen) for all Christian saints who didn’t have their own name day. 11th century – November 2nd was dedicated as All Souls’ Day to remember all friends and family members who had passed away in God’s grace. It was widely observed in Sweden with bell ringing and processions in church cemeteries. It even survived The Reformation under King Gustav Vasa in the 16th century. 1772 King Gustav III decided there were too many work-free holidays and moved several holidays around. All Souls’ Day was combined with the date of All Saints’ Day. 1953 the Swedish state church and parliament worked together to move All Saints’ Day (Alla helgons dag) to the first Saturday in November because there weren’t any holidays in the calendar between Midsommar and Christmas (at that time Saturdays were a work day). 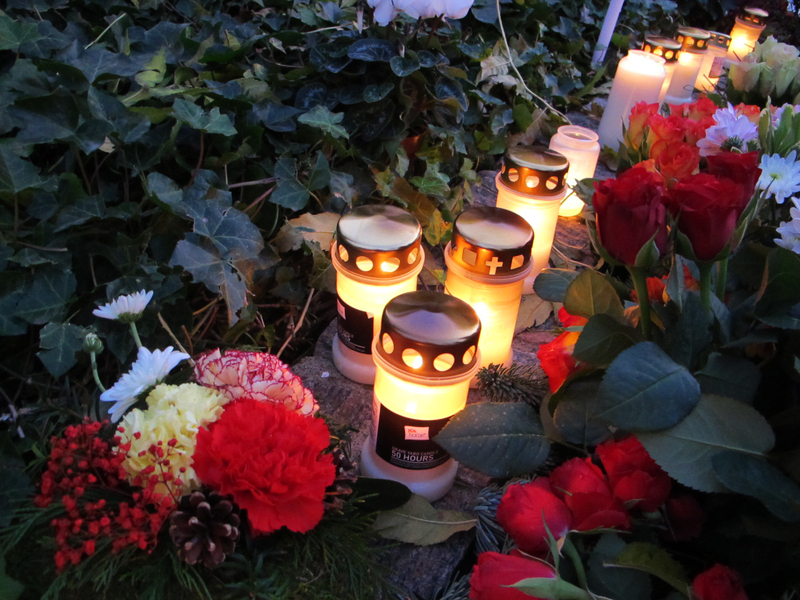 The custom of lighting candles to place on graves was brought to Sweden from Catholic countries to the south. From the 1890s it was common in Stockholm and larger cities to place lighted candles on graves at Christmas time, particularly on the graves of children. Media images of candlelit graves during WWI and WWII served to increase the popularity of the practice and it became more commonplace from the 1920s onward. Today November 1st still shows up as Allahelgonadagen on the calendar but the ‘red day’ or holiday of Alla helgons dag, is on the first Saturday in November and many people have a half day of work on the Friday prior. It used to be that shops were closed on Alla helgons dag but that is becoming less common. People begin lighting the special 50 hour long-burning candles on Friday afternoon so they burn through the weekend. During Alla helgons dag churches often have their own candle-lighting ceremonies where they light a candle for each member of the congregation who has passed away in the last year. One of the most stunning places to be in Sweden on Alla helgons dag is the UNESCO World Heritage Site Skogskyrkogården (The Woodland Cemetery) in Stockholm. I had the opportunity to visit there on my first trip to Sweden back in 1998. It is spectacular on an ordinary day, but on All Saints’ Day it is supposed to be breathtaking with all of the candlelight. I hope to go there in person on Alla helgons dag one year but in the meantime you can watch this beautiful video on the web that shows how spectacular it is. I never thought much about Alla helgons dag before this year. I didn’t understand what it was about or even know that people were lighting candles and leaving flowers in cemeteries. That is why I love working on this blog. I am learning so much more about my adopted country and I love sharing that information with anyone else who might be interested. The beauty and reverence of Alla helgons dag is touching. Even if you can’t make it to the place where your loved ones are buried, many Swedish cemeteries have a minneslund (memory grove) where all are welcome to sit and remember those who have gone before us. This weekend I am especially thinking of my friends and loved ones who have passed away and will join the Swedes in lighting a candle for them. Love the link to the video. Really beautiful!! Curtis is here with us and told us the name in Swedish style, not English as I would have butchered it. The girls are sitting here with us and watched too. Loved the scene with all the tall trees. I love the video too. So glad you enjoyed it as well. That cemetery is really one of the most impressive places I have ever been. It is a real triumph or architecture and landscape architecture. I remember my Scandinavian Architecture professor in graduate school said it’s a place that all young architects should visit and I absolutely agree. I’ll add some kind of phonetic spelling to help people with the pronunciation.